Do you need to replace a worn down chainsaw bar? If you know the pitch, gauge, length, or type of guide bar you need to replace, select your manufacturer below. 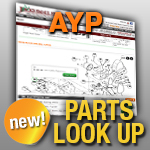 You can also use our easy Oregon Parts Lookup to locate a replacement chainsaw bar for your specific model. We also supply chainsaw chains and bar nuts. Carving Bars:The slender, small radius nose is perfect for fine detail woodworking and carving.